For all of you who have been dreaming of traveling the country in tubes like a bunch of supersonic hamsters, 2016 is going to be a big year, thanks to plans for what’s being billed as an actual, full-scale Hyperloop track in California. 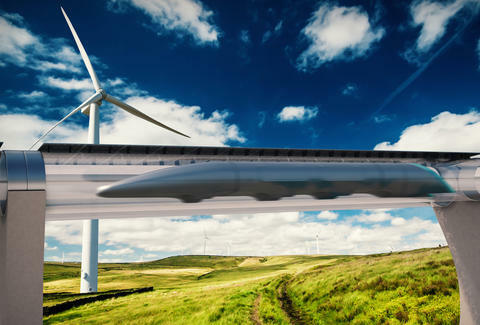 The Hyperloop is Telsa CEO Elon Musk’s fantastical idea of an aboveground transportation system made of tubes that will carry passengers around Central California at supersonic speeds. Well, at least eventually. According to a report by Wired, there are plans to build the first Hyperloop track along I-5 near the planned community of Quay Valley – but it will only be five miles long, which isn’t enough to reach the 700mph Musk originally promised when he shared the idea with the world in 2013. To reach speeds like that, you’d need about 100 miles of track. But speed isn’t the main objective with this initial hyperloop. The idea is to test and tweak the practical elements like station setup and pod design, Wired reported. Basically, it’s more about proving that this thing can actually be built and work. Before construction can start though, Hyperloop Transportation Technologies, the company that wants to bring all this to life, will need to come up with $100 million, which it expects to raise later this year through a direct public offering. The “short term” goal is to get this first segment up and running by 2019 so people can test it out. In the future, we will probably see tracks stretching from NorCal to SoCal, with trips from LA to San Francisco in just 34 minutes -- if Musk and Hyperloop Transportation Technologies have their way. Musk also tweeted plans to start working on his own Hyperloop test track, most likely in Texas. Oh, and he’s thinking of holding annual student Hyperloop pod racer competitions, because why not. Emily Kolars is an Editorial Assistant at Thrillist. There's nothing she'd rather do than speed around in a tube like a supersonic hamster. Except for maybe anything else. Follow her on Twitter @emilykolars.